The Fuerza Local Business Accelerator program recently graduated its most recent class, but a select group from the cohort of 58 businesses couldn’t wait until their graduation to put their new-found knowledge and skills to work. A group of businesses from the 8th cohort is revolutionizing the startup industry by making collaboration the new norm. Angela Solorio and Jon Fernandez, co-founders of GeekiTek and graduates of the 8th cohort of the Fuerza Local Business Accelerator, are taking home-based businesses out of their comfort zone and offering a fun way of getting into an office space. Angela and Jon understand the importance of working together. 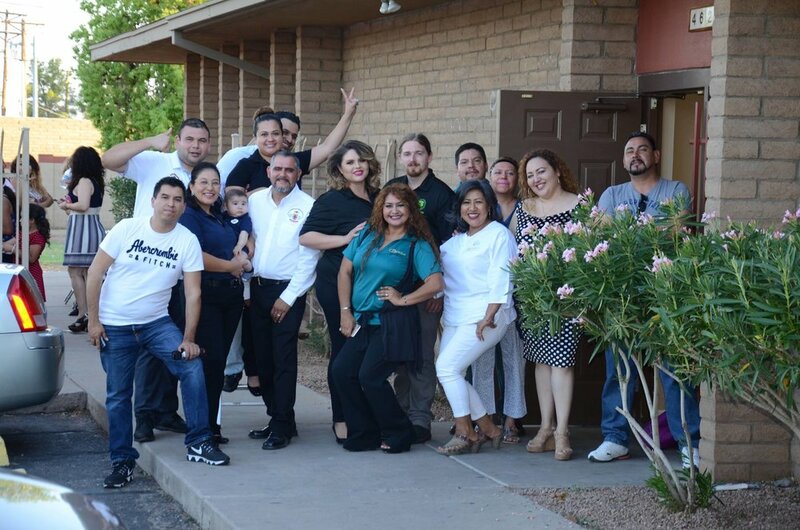 They opted out of an 800-square foot space and decided to invest in a 4,000-square foot location that would allow them to invite their peers and colleagues to share the space and create a co-op in West Phoenix, housing only Hispanic-owned businesses who are also all members of Fuerza Local. Power Plaza is located near 35th Avenue and Camelback Road in West Phoenix. The space will be the new home to seven businesses from a diverse array of industries, including technology, web design, graphic design, fashion, and personal health. An additional three food trucks will take over the outdoor space and offer a rotating menu for the community to enjoy. The idea of behind Power Plaza is for each tenant to be able to lean on each other for support and serving as a referral system for services offered at the co-op. Power Plaza and the team behind the co-op help define what Fuerza Local stands for, and the idea of “stronger together” has never been clearer. El programa Acelerador de Negocios de Fuerza Local recientemente graduó a su más reciente clase, pero el grupo de 58 negocios no se pudo esperar hasta la graduación para poner sus nuevas enseñanzas y prácticas a trabajar. Un grupo de la octava generación está revolucionando la industria empresarial. Angela Solorio y Jon Fernandez, co-fundadores de GeekiTek y graduados de la octava generación del programa Acelerador de Negocios de Fuerza Local, estan sacando a negocios basados en casas de su zona de comodidad y ofreciéndoles una manera divertida de adquirir un espacio de oficina. Angela y Jon entienden la importancia de trabajar juntos. Pasaron la oportunidad de adquirir una oficina de 800 pies cuadrados y decidieron invertir en una ubicación de 4,000 pies cuadrados la cual les permitió invitar a sus colegas a compartir el espacio y crear una cooperativa en el oeste de Phoenix, disponible a negocios hispanos y miembros de Fuerza Local. Power Plaza está ubicada cerca de la 35 Avenida y Camelback Road en el oeste de Phoenix. El espacio será el nuevo hogar para siete negocios de una diversidad de industrias, como tecnología, diseño de web, diseño gráfico, moda, y salud personal. Tres loncheras también tomarán el espacio de afuera y ofrecerán una variedad de platillos para que la comunidad disfrute. La idea detrás de Power Plaza es que cada negocio puede depender de uno al otro para apoyo y trabajar como un sistema de referencias para servicios ofrecidos en la cooperativa. Power Plaza y el equipo detrás de la cooperativa definen lo que Fuerza Local y la idea de “fuerte juntos” nunca ha sido más clara. In Tucson, the Food Conspiracy Co-op has stepped up to support Local First Arizona and Tucson’s local business community with a grant from the Cooperative Community Fund. As the year comes to an end, it's important to make sure you have considered all the steps that can help strengthen your finances. Here are a few ideas to make the most out of 2017 and beyond. You may not know it, but Arizona has been a leader in managing water for decades. In this blog post you will learn some easy steps to engage in water conservation for your business or household. Establishing the right connections and building business relationships can often play a huge role in your business success. There is no better way to network and connect with people than to sign up and attend events aimed at building business relationships. Unfortunately, entrepreneurs sometimes get lost in the mix of attendees and they don’t meet the right person to help them elevate their idea. Fortunately, there’s an app for that! The lifelong dream of becoming a music teacher began with a keyboard and some space in his small apartment’s living room. With his wife Eriselda’s support, hope, talent, and makeshift business cards in hand, Beto began recruiting some of his first clients by standing outside of grocery stores and promoting his services. There is no shortage of Mexican restaurants in Arizona, which means authenticity scores points, and authentic is exactly what Martha’s Kitchen serves up. Located in east Mesa, this new spot cooks up Sinaloa style grub that is affordable and sure to please your taste buds.